Alex Ovechkin as a Blue Jacket? Patrick Kane as an Oiler? It could have happened if the draft lottery wasn't altered by these meaningless, regular-season games. th overall spot that ended up turning into Connor McDavid. But for some seasons, you can pinpoint one game – sometimes even one moment – that changed who was holding the winning ticket. And that can open up a world of “what if” for the team that just missed. Here are five times that one forgotten game flipped the lottery results and (maybe) changed the destination for a superstar player. most confusing sets of transactions in NHL history, the Sharks ended up owning the Panthers pick and won the lottery, leapfrogging the Lightning. But thanks to a previous trade, the Lightning held the right to flip picks with the Sharks, so they leapfrogged right back into the top spot. In hindsight, it was one of the most successful insurance policies in recent memory, one that landed Lecavalier in Tampa Bay for the next 14 seasons. scoring the winner. It was October 3, 1997. That date is already a dark one in Canucks history, remembered as the fateful day that Linden handed over the captaincy to Messier. But in hindsight it may have been even more costly. Take away that win, and the Canucks drop to 62 points for the season, one back of the Panthers and into the second last overall spot that turned out to be holding draft lottery gold. Vincent Lecavalier in Vancouver? Gosh, Canucks fans, just think how much he could have learned about leadership from playing with Messier. Rick DiPietro), but the lottery gods offered up some karmic payback in 2001 anyway. The Thrashers finished with 60 points, good for the league’s third worst record, then won the lottery and jumped past the last-place Islanders. What actually happened: Heading into what was widely considered to be one of the best drafts in recent memory (and turned out to be even better than expected), the Hurricanes plummeted to dead last just one year after going to the Stanley Cup final. But it was the 70-point Panthers who won the lottery; they’d ultimately trade the pick to the Penguins, who took Fleury. was an obvious dive. The NHL didn’t fine divers back then, but Briere’s flop may have been costly. If the Panthers had won the game, they would have finished the season two points ahead of the Sabres, who would have won the lottery and earned the first pick in arguably the best draft in NHL history. 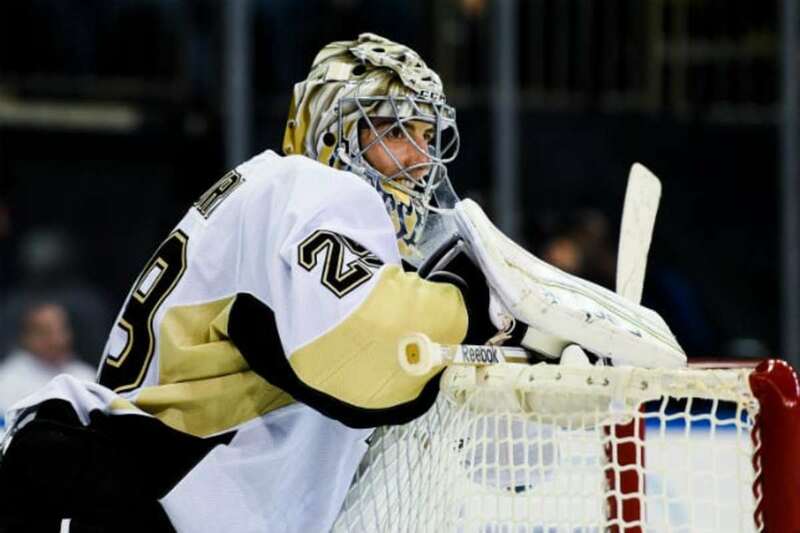 Would they have taken Fleury? It’s possible. This was Ryan Miller’s first NHL season, and the former fifth-round pick wouldn’t establish himself as a starter until 2005-06, so maybe the Sabres grab Fleury as the heir to Dominik Hasek. Or maybe they take the best forward available, center Eric Staal. Or the top defenseman, Ryan Suter. Or maybe they go off the board and grab someone else from that loaded draft, like Ryan Getzlaf or Zach Parise or Brent Burns or Corey Perry or Shea Weber or Patrice Bergeron or… you get the idea. Or maybe they grab the guy they ended up picking with the fifth overall pick, Thomas Vanek, and none of this matters. We never got to find out, at least partly because of one well-timed dive. What actually happened: The race for last place came down to the wire, with the Penguins claiming the spot with 58 points. The Blackhawks and Capitals were next, tied with 59 points, with the Blackhawks taking second last spot on the tie-breaker and the Caps ending up third. The Blue Jackets weren’t far behind, finishing with 62 points. The third slot was the lucky one. The Capitals had it, and moved up to first spot overall, where they took Ovechkin. the Blackhawks hosted the Blue Jackets in the back half of a home-and-home. Chicago had won the first game, and on this night they held a 3-2 lead midway through the third. But the Jackets came back, getting a late goal from Geoff Sanderson to tie the game and then the winner from Luke Richardson with less than three minutes left. If the Blackhawks had held on for the regulation win, they would have finished the season with 61 points, while the Blue Jackets would have dropped to 60. That would have nudged the 59-point Caps up to second last, and left Columbus all alone holding the winning ticket in third spot. By the way, that winning goal that ended up costing the Blue Jackets the chance to draft Ovechkin was the only one Richardson scored all season. worst draft lottery loss in NHL history. this happened. And nobody realized we were watching history change at the time.